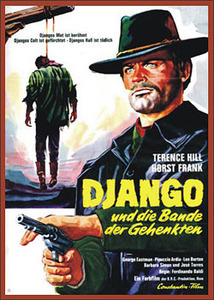 (1968, aka VIVA DJANGO) Terrence Hill, Horst Frank, George Eastman, Barbara Simon. Considered by some to be the best Django movie. In this superb Euro-western thriller, Django is hired by a corrupt political boss to hang innocent locals so the boss can grab their lands. However, Django isn’t really hanging these guys. He’s actually recruiting them so he can gain revenge against the boss who—along with Django’s former pal—caused the death of his wife. A must see. Widescreen, 35mm.